A great portable alternative to build a permanent grows room. By using this grow tent, you can easily provide the seeds with steady supply of light, temperature and water for optimal germination to occur. We adopt iron pipe + plastic hook design to prevent items damaged by heavy stress or violent vibration in the process of transportation as this improved grow tent. Can precisely control the temperature, humidity, light intensity and light use of cycles. 100% LIGHT TIGHT & 98% SUPER REFLECTIVE - Reflective white interior, 100%-reflective mylar lining gives an efficiency boost to lighting setups of any power configuration. Eco- Friendly material and Reinforced Frame design : ORKAN growing tent is made by super quality pvc, different with PE, it is more soild and stable and durable without any toxin. It is resisting high tempreature to 180 degree max. (PE generally cound not be used up to 120 degree). Genuine Safe and reliable for your plants. AND the Reinforced frame design for a long-life using. Quick and easy to assemble, Zippers zip easily. Material is washable inside and out, so all odors can be removed. Also it is Waterproof and crack-free. Available for all Greenhouse plant cultivation, planting flowers,Can precisely control the temperature, humidity, light intensity and light use of cycles. Fast delivery and offer you 1 year quality Garantee: We ensure to delivery the quality tent with the decreet box to you. 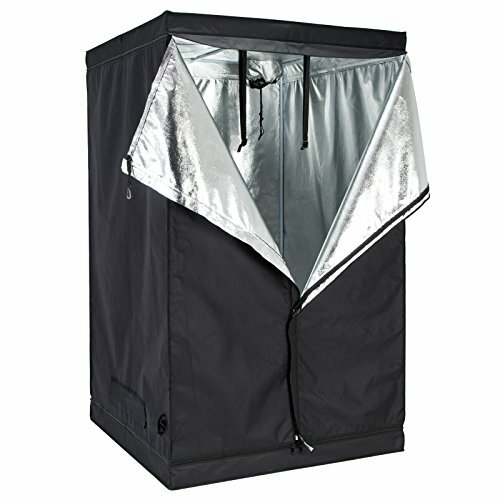 LAGarden 4x4x6.5Ft 100% Reflective Diamond Mylar Hydroponics Indoor Grow Tent Non Toxic Planting Room 48x48x78"